Just a little longer from Dakota ridge, right? Uh, well, yeah, like 2 hours, all at the end. Which in this heat is a lot. Besides, the Orderville Jeep Trail was nicely graded, and the scare-the-bejeezuz-outa-Tom ditch is nowhere to be seen, as I found out a few days later, when I shuttled some friends down for an Orderville trip. But, onto the ACTUAL trip report. We drove down the Ridge road as far as seemed smart. Coulda gone another tenth or two. We hit the trail at 9 am. We carried ropes n stuff. Followed the map, with ONE waypoint on the GPS. We being for this trip myself, Cassy Brown and Rachel Ross, both from ZAC/Springdale. We left the road and walked into the woods. Two minutes in, we hit the 90 foot drop Luke warns of. Big beautiful Ponderosa at the base of the drop - very nice. We skirt the drop to the left and shimmy down the steep hillside to the canyon bottom. A few nice narrows followed, with a few nice downclimbs. And then to the top of the big rappel. (Soapbox Time): Off to the side, there is a tree with a blue sling. THE anchor for the first drop, at least according to various beta available. Getting to the tree looks unpleasant - the old sandy slanty walk over to a tree on the edge... I'd hate to take beginners out this way. Why rappel over the side, rather than down the watercourse? What's my soapbox-beef with this? There is a perfectly good Big Friendly Rock right at the top of the drop at the watercourse. Easy to rig (though requiring quite a bit of sling), easy to start the rappel, easy to pull. Easy easy easy. Safe. Conspicuous. So why would ANYONE EVER use that tree off to the side? No. No. No. #1: you should always be thinking. #2: people who make bad choices leave slings behind. #3 just because it is in your beta does not make it where you should rappel (see #1). #4: bring some webbing, ok? There are two targets to this rant (and this is an example - this occurs in many other canyons too): Experienced Canyoneers, and beta providers. 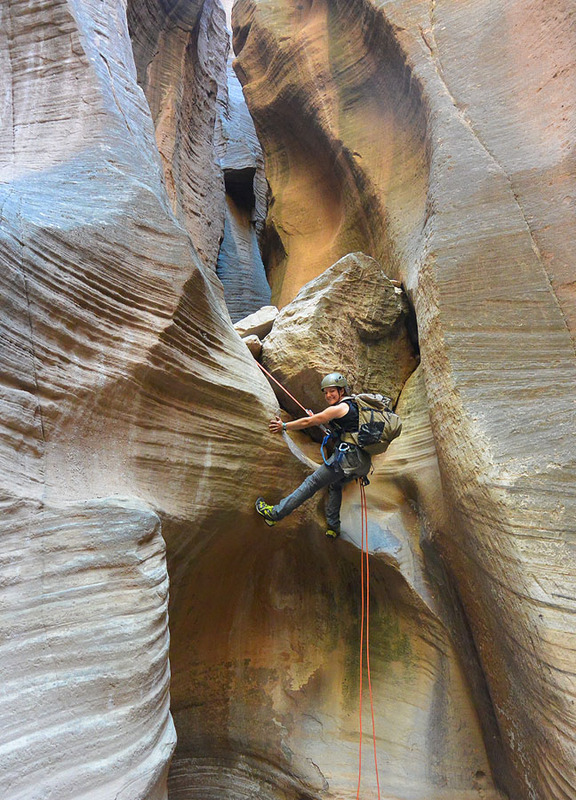 Experienced Canyoneers (hence "EC") should (a claim of moral obligation) fix things when they go down a canyon. Worn webbing? Replace it. Dodgy anchor? Find a better one (this example). Six slings all a different color around a tree? - cut them away, install a single black sling. Fixed handline left for a downclimb? Remove it! etc. etc. etc... Yes, sometimes it is not possible to fix EVERYTHING in a canyon, but you should (moral obligation again) at least do as much as you can. 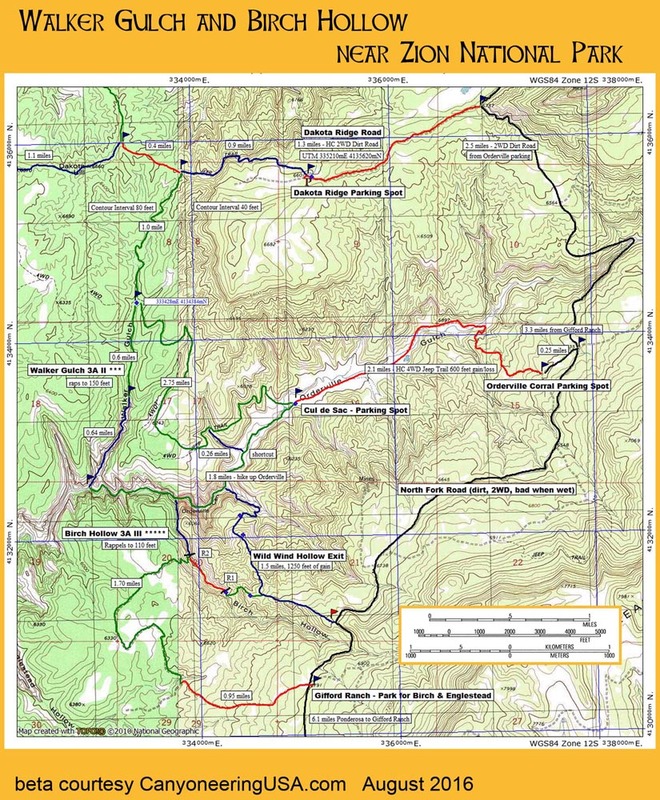 We ECs need (moral obligation) to leave canyons we do in excellent shape because, we all know, there will be ten parties with only a vague idea of what they are doing descending the canyon before the next EC comes along. And as much as it scares me to say so, this includes Imlay and Heaps (though, probably not ten). We cleaned the blue (ick!) sling on the hard to get to, off to the side tree, pulled out a long piece of webbing and rigged the Giant Rock perfectly positioned for the rappel down the wonderful flute, set the rope up with a FiddleStick as much to show Rachel how it is used as anything else, and slid down the rope enjoying this wonderful rappel. Rachel got to go back up, since she forgot to take out the safety, and back down again. A quick, firm tug and the rope and pull clatter to the ground. OK, just the FiddleStick clatters, the rope kinda ker-plunks. A bit downcanyon, we come to a short drop with lots of logs jammed in. We choose to rap under the logs rather than test the stability of the logs. A few more steps downcanyon, and we are at the final rappel. There is a sling around a rock, but the rock is not very secure. We pull off the sling, find another rock to tie off, choose a better place to put it and stack a bunch of rocks around and on it. Much better! Quick short rap. Harnesses off, walking from here. Nice walking. A couple little downclimbs. Wonderful striations in the rock, and quite a long section of nice narrows with tall walls. We walk for awhile, then pull over in what might be the end of the shade to have some lunch, then walk some more. Fairly soon, we pop out into Orderville canyon - as in, out into the sunshine. Warm. We walk upcanyon, past Birch, past Wild Wind Hollow, climb the hill at the Orderville dryfall. A few feet further and we see the shortcut back up that Luke details (thanks Luke). We clamber up this and pop out on the ATV trail that will take us back to the car. Eventually. As in, 2 hot hours later! Yeah!!! Time to leave the road. The first drop, non rappel. Made it to the ATV track above the shortcut.